Updated with modern theories but still not quite modern graphics, Carl Sagan's immortal Cosmos returns to TV next spring with affable astrophysicist Neil deGrasse Tyson this time captaining the starship to show us dummies what's going on with the universe. Here's the series trailer, a musical and visual spectacle of the wonders of existence--plus a wolf fight, in case you get bored with spectacle and want to check out some wolves go at it. Such are the marvelous possibilities in the vastness of space and wolves. 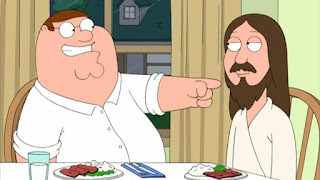 Sagan's widow Ann Druyan executive produced the series with Family Guy's Seth MacFarlane, if you were wondering why cartoon Jesus showed up. \n\nUpdated with modern theories but still not quite modern graphics, Carl Sagan's immortal Cosmos returns to TV next spring with affable astrophysicist Neil deGrasse Tyson this time captaining the starship to show us dummies what's going on with the universe. Here's the series trailer, a musical and visual spectacle of the wonders of existence--plus a wolf fight, in case you get bored with spectacle and want to check out some wolves go at it. Such are the marvelous possibilities in the vastness of space and wolves.